BlogHer Food '10 Pity Party: I'm Going, Are You? BlogHer Food '10 Pity Party is my kind of party conference. It takes place entirely online, mostly on twitter, and scheduled sessions are conspicuously missing from the agenda. 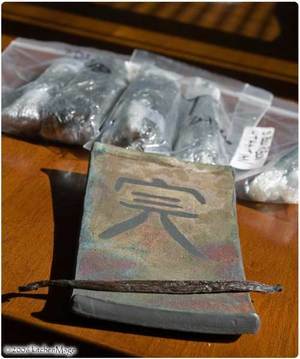 The agenda which, come to think of it, is also nowhere in evidence. You don't have to buy tickets or fly anywhere, nor pay for hotels, food, or cute new shoes. Sure, you also miss out on all the fun stuff that happens at conferences that happen in a single physical locale: parties and noshes and swag, oh my! Lovage is one of those obscure, sort of old-world herbs, that few people seem to have heard of. You may even have some in your garden, like some friends of mine, who were nevertheless, unsure exactly what it was - it looks, smells and tastes like celery, after all, but it never actually grows any celery stalks. Confusing beast. What started as a whimsical answer to weekend cat blogging is now a weekly excuse to play in the herb garden. Oh gee, how awful - not the herb garden! Kalyn has nurtured little whb, and now it's all grown up, with its very own set of rules, and Kalyn lets it escape the confines of her kitchen every other week to be guest hosted somewhere on the tubes of the 'net. Weekend herb blogging is at Once Upon a Tart, the home of the Brownie Babes this week, so get yourself over there to check out the roundup. My first recollection of lovage only goes back a decade, to one of those 9 course tasting menus at the Herbfarm, which included Columbia River sturgeon in a ragout of apples, leeks and lovage. While I liked it quite a bit, someoneElse announced then and there that he was going to have to figure out how to make it. I offered, "It's in his cookbook," and someoneElse has been offering me food with lovage ever since. Most of the time, youngish leaves are used - they toughen as they get older, so save the mature stalks for soups and other dishes where you will remove them before serving - chopped up to lend a slightly more complex celery flavor to food. The stalks, however, are hollow and lend themselves to all sorts of interesting uses. As a straw, for example, for a bloody mary or other vegetable juice based drink. 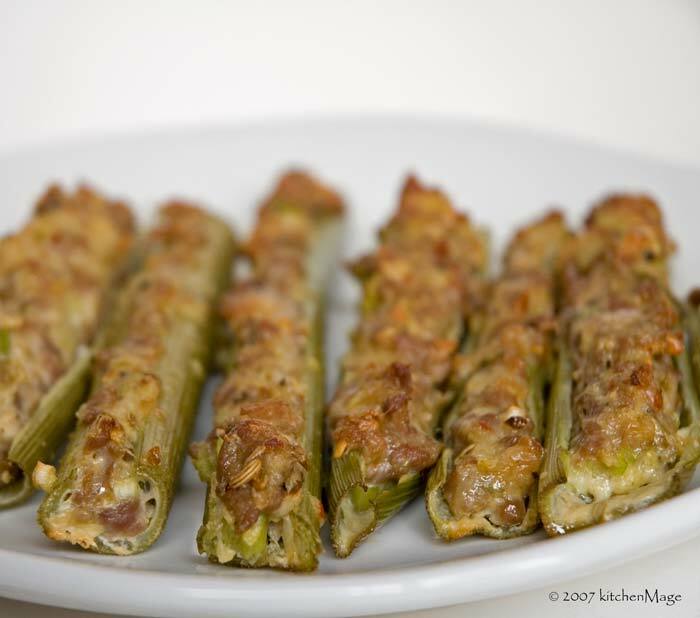 Rumor has it that you can candy the stems like angelica, although I have never done it. You can even make them into decorative thingies by slicing them and tossing the cut pieces into ice water. Strange but true. What I wanted to try was a bit different: creating an appetizer by stuffing the fattest stems I could find with...something. it's a bouncing baby blog! I feel almost like a proud parent on the first day of school, watching my baby walk off alone into the big, bad world. (Somewhere, theKid is reading this and cringing.) In this case my baby is a it more virtual, and luckily the labor pains were much less painful. 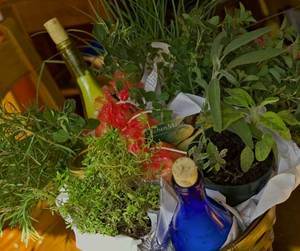 Welcome kitchenMage's Herb Garden to the World Wide Web! Grown less than a mile from me on an organic farm, these tomatoes were downright inspiring. So much so that I had to let the garden open its gates before it was fully leafed out, so to speak, but I'd love it if you'd go visit. Not much bigger than those tiny little tomatoes, the Herb Garden is showing off a recipe I made up last night for Three Tomato Pasta - a fast and delectable way to use up a bit of the season's bounty (and my contribution to weekend herb blogging). And don't forget to wander over to Kalyn's Kitchen to check out this week's herb blogging roundup. Lovage (Levisticum officinale) is one of my favorite herbs you have never heard of. The herb's lack of public recognition always seems odd to me. It's a versatile herb with a palate-friendly flavor a lot like celery, yet more complex and nuanced. 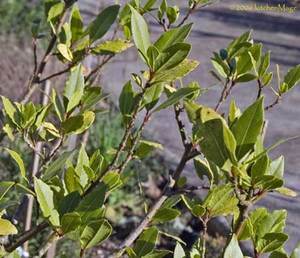 Fresh, young leaves are mellow enough to use whole in a salad, but it also stands up to long cooking in soups and stews. The obvious presenting flavor of lovage is celery, but the flavor is more complex than that. Along with the concentrated celery is a large dose of the bright green flavor of parsley and a hint of something sweetly earthy. I use it as a celery substitute whenever it is available and find it provides some ineffable extra taste that I really like. 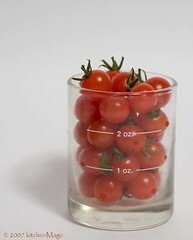 The hollow stem, a section of which can be up to a foot or more in length and an inch in diameter, makes an excellent straw for drinks, such as a Bloody Mary, where a celery flavor is desired. Lovage stems can be candied, like angelica, as an unusual sweet treat. Excuse me a moment of excitement, but I just discovered a new trick for lovage stems: sliced lengthwise and put in ice water, they curl like the ridged curling ribbon they make for wrapping presents! This offers all sorts of possibilities from the sublime (make a brush for putting melted butter on corn on the cob) to the ridiculous (edible icons of the Flying Spaghetti Monster). 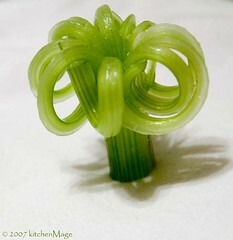 Curlicue garnishes. Hair for Halloween monsters. This could be fun. 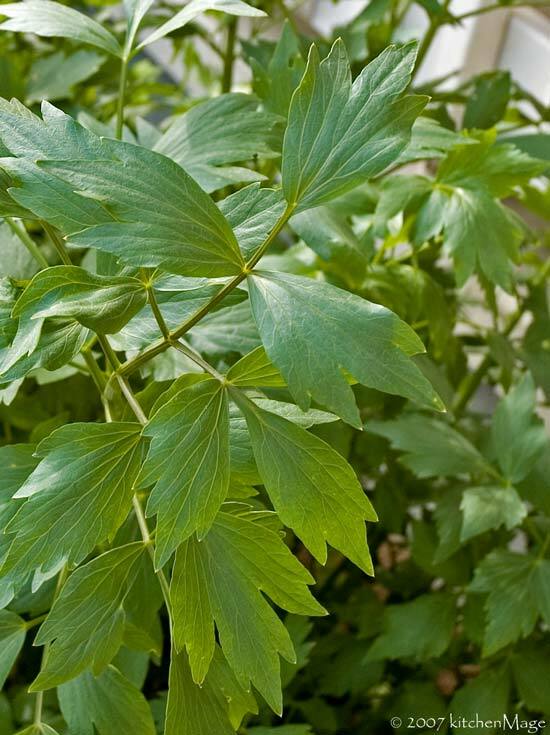 Lovage is also a beautiful addition to your herb garden. Unfurling from asparagus tip-like bundles in early spring, lovage quickly becomes a hip-high bush of soft green foliage. Midsummer sees flower spikes shooting to eye level before opening golden umbels that slowly mature into marvelously tasty seeds, something the birds know as well as I. Come fall, the birds and I vie for themature seeds, with my winnings finding their way into stews and breads over the winter. A perennial that, like tarragon, requires a period of cold dormancy, lovage is often grown as an annual in warm climates. If you have to do this, you can save your own seeds, stored in an airtight jar in the refrigerator, over the winter for spring planting. You can often find plants at a local nursery, although probably not at a 'big-box' store, and seeds are available from a number of sources, including Territorial Seeds and Seeds of Change. Better yet, keep an eye out for a plant in the garden of a friend or neighbor; If you see one, don't be afraid to ask for a start for your garden. 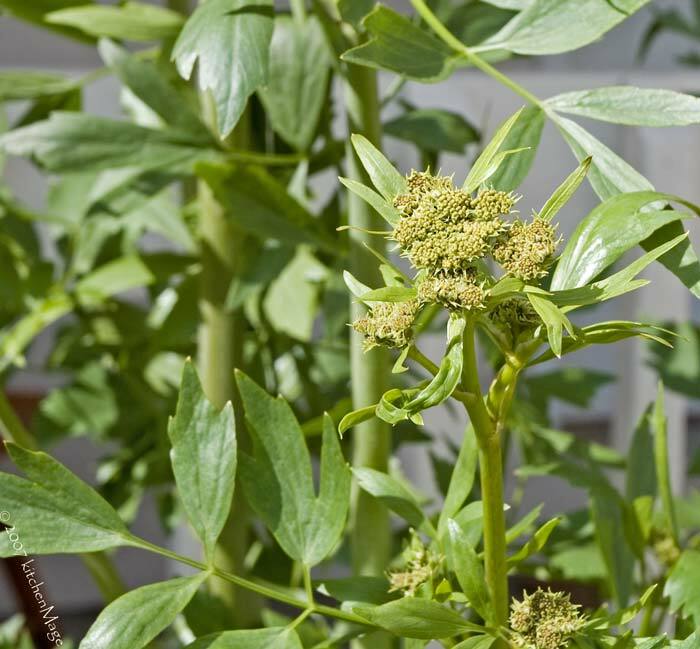 A single plant is enough to supply all but the most avid of lovage fan - and two will do for even them - and since lovage self-seeds, there are often small "volunteers" growing around the base of established plants. 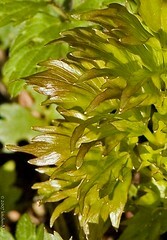 Spring (now as I write this) is the perfect time to divide lovage clumps, preferably on a cool, cloudy day. It's been a while since I've been tagged for a meme (maybe because I only do them intermittently) but Tara of the Three Tarts pinged me for this and it's one of the more useful memes I've seen in a while. Besides, I have a slightly different take on my answers so I'm going to play. Melissa of the ever-tempting Traveler's Lunchbox has asked for everyone's lists of five foods to eat before you die. The meme has been circulating for a month or so and the collected responses are...holy crap! I just went to grab the URL and it's at 1550 items to eat before you die! That's one new thing a day for FIVE years! You no longer have an excuse for being bored with your food, go pick something off the list. Then go do it again. And again. And again. And again. Cookies that you baked with a monstrrr (that would be a child for those of you without crib notes), especially if it's their first time baking their favorite cookies. I've made a point of telling visiting monstrrrs that we can bake any kind of cookies they want, even make something up if they'd like, and it is one of the surest hits ever. I've had twenty-somethings remind me of the day we baked their very special cookies — all of which end up named after the kids, "Kara's extra-cinnamon Snickerdoodles" and "TashiaDoodles" (since perfected on her own time) and such — and what we drank, and how the conversation has stuck with them years later. This is about so much more than cookies, they are simply the vehicle for awakening the knowledge of the wealth of experiences to be had when making and breaking bread with those we love. Plus, you often get a new cookie recipe out of it. Something slightly unlikely with someone very special. One of my latest examples of this is vanilla ice cream with fresh blueberries. It's not exactly gourmet — although there are no doubt restaurants selling french vanilla ice cream with fresh blueberries for 7 bucks a serving (or would that be freedom vanilla with patriot berries?) — nor is it even unlikely in and of itself, but it was pretty unlikely at the time. And the perfect thing for the moment. The moment being 3am, which found the two of us, having just sent off chapters for the current book project and having a moment to relax, picking the berries by flashlight while some very confused kittens ran circles around our ankles. Way too much of a favorite food. This is another thing that is perhaps best done with a child. I have fond memories of a couple of childhood food indulgences: strawberry shortcake dinners on the first day of strawberry season, a flat of Bing cherries on the first day of cherry season, the birthday child's choice of dinner and dessert. Oddly enough, we ended up with the same cake several times a year as one child after another chose "that chocolate cake, you know the one"...and we did know "the one" because it was the same as always. I should note that when I had a chance to have "the cake" at the Nut Tree Restaurant, which is the source of the recipe, it was just about identical to the one that we made. A child's invented dish that makes you go "ick" Every kid has concocted something that they absolutely love and would eat every day that makes their parents retch. theKid's was hot dog and sharp cheddar omelettes with jelly; it had to be cheapish hot dogs (no hebrew national kosher for her) with Tillamook sharp cheddar (black label extra sharp if she could get it) and jelly, not jam. There is some aspect of this that totally squiks me out; maybe it's the insistence on jelly...or the cheap hot dogs...but ewwww, ick! I did have this once, well I had ONE bite of this once, and have managed to escape a repeat performance. Luckily for me, someoneElse was more cooperative and used to make two at a time so he could eat one with theKid...usually while I hid in another room. Something that stretches your cooking skills I almost made this 'homemade bread' but that's second nature for some folks and that's so not the point. Think of a food you really love but would never try making, then make it. Having been raised to be utterly fearless in the kitchen, I still find some pastries intimidating and have had to twist my own arm to make myself attempt them. Having lost my fear of danish and pie crusts, I'm moving on to something else...those gorgeous molded chocolates are looking more appealing lately, even though tempering chocolate seems tricky. But tricky is good. No tricky=no feeling of accomplishment. Maybe you can see a pattern here. For me, food is about much more than food. It's about creation, sharing, indulgence, validation of individual quirks (even the ones that make you go ick). And if you help inspire a child to cook and enjoy good food you are doing a doubly good thing. I'd tag someone but I am late to this party so most of you have already done this. Oh wait, Miz D. has been moving and busy, I'll be mean and tag her! And Cherry because she has more energy behind her collection of blogs than I can imagine. Weekend Herb Blogging is Kalyn's weekly venture into the land of herbs and always offers a collection of international food writers weighing in with delightful ideas for using the goodness that is fresh herbs. The onset of fall in evenTinierTown brings morning fog, cooling afternoon breezes, and the annual wine tasting and auction, an event that always brings out a crowd to sample food and drink before spending a few dollars on a variety of donated goods. Depending on the amount of wine involved, the spending may climb to more than a few dollars...or so goes the devious plan. Weekend Herb Blogging is Kalyn's weekly venture into the land of herbs and always offers a collection of international food writers weighing in with delightful ideas for using the goodness that is fresh herbs. . This week's edition of Weekend Herb Blogging is being guest-hosted at The Inadvertent Gardener. 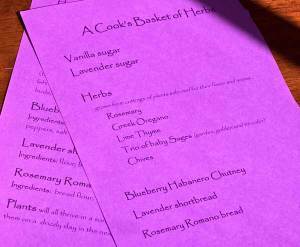 Lavender is lightly sweet, and adds a vaguely floral note to food. Too much can be cloying, or "soapy," something which using scented sugar helps avoid. It's hard to go overboard because your food gets too sweet long before it gets too lavendery. It's perhaps the best complement to berries out there, bringing out the berriness without dulling the flavor (as vanilla sometimes does). I use it to macerate berries for shortcake, in whipped cream, even in the shortcake. It's also great in sugar cookies and other lightly flavored treats. If you buy lavender, make sure you get culinary not aromatic as the latter may have oils or other non-tasty things added. I pick mine from the garden — just when the buds are showing color, but before the flowers open — and use them fresh. As you can see from the picture, I'm not the most particular about cleaning out the papery part of the bud, but you could be if you have nothing else to do with your time. I use about 2 tablespoons of buds for a quart jar of sugar and let it sit for a month before the first time I use it. I seldom use more than 1/2 a cup at a time so I just top off the sugar, shake it every time I take some out and it goes on forever. Well, almost. I usually add more lavender when I have a fresh harvest. When using the sugar, you can pass it through a strainer to remove the buds or leave them in. I usually strain it for things like whipped cream or sprinkling on berries, but leave the buds in if cooking the sugar in something. You can also toss the sugar with buds in a food processor to grind it up a bit, which is what I do for lavender shortbread (recipe to be here soon). Weekend Herb Blogging is Kalyn's weekly venture into the land of herbs and always offers a collection of international food writers weighing in with delightful ideas for using the goodness that is fresh herbs. 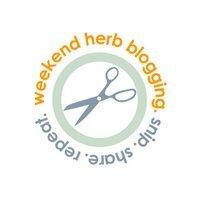 This week's edition of Weekend Herb Blogging is being guest-hosted at The Cooking Adventures of Chef Paz, where Paz kicks it off in style with a Chickpea Feta Coriander Salad from Falling Cloudberries. Our last house was painted a warm off-cream color called Pudding, the vanilla pudding was implied, but it was clearly the intent of the name. It was a color you would be happy to see in a vanilla custard; opaquely thick, barely off-white with the merest hint of color from beaten in egg yolks. It wasn't chocolate pudding, or butterscotch, or even banana. Had the paint manufacturer been smarter, they would have been direct and called it Vanilla — which is ever so much lusher than "pudding" and probably worth an extra buck a gallon. Anyone with a wee bit of search skills can turn up some "vanilla" things that are anything but bland, boring, vanilla. Case in point: The Vanilla Tapes. Not exactly bland and boring. Neither is real vanilla. Swiping a meme here and warping it. I've seen it at a variety of places, seems all the popular kids are doing it, or will be soon. It's sort of an instantTag meme, since I get to ask the questions and you get to answer them in comments. This will either be enlightening as I discover more about you all or embarassing as I discover how few people read this thing...or both. Are there dishes you want to make but don't because they intimidate you somehow? What is your proudest kitchen accomplishment? If you could ask me to make any one food and blog about it, what would it be? Weekend Herb Blogging is Kalyn's weekly venture into the land of herbs and always offers a collection of international food writers weighing in with delightful ideas for using the goodness that is fresh herbs. This week's edition is being guest-hosted by Virginie at Absolutely Green who has a French-English blog with some yummy looking pictures of food and France both. Of all the herbs in my garden, I brought three plants with me when I moved, leaving the rest to overwinter in a friend's yard while we got settled. A Tuscan Blue rosemary, the largest of the spanish lavender, and the sweet bay tree rode with me and the cats in the pickup truck. Had I been forced to a decision, the rosemary and lavender could have spent the winter with the rest, but the bay had to be with me. Pretty strong feelings for an herb whose dried leaves are actually not too bad, widely available and usually inexpensive. For many cooks, bay is a necessary part of the melange of herbs used in things like soups, stews, pot roasts, and, of course, marinara sauce. When used this way, bay provides a difficult to describe flavor that adds a sort of depth and complexity to the dish without leaving a discernable flavor of its own. To paraphrase former Supreme Court Justice Stewart, I may not be able to define it, but I know it when I don't taste it.